Getting ready for a new baby can be overwhelming, but now is an amazing time to be welcoming a little one to the family: recent advancements in technology can make parenting easier than ever. Most parents know the basics of baby proofing — use outlet covers to avoid electrocution and door knob covers to thwart escape attempts, for example — but home automation and smart technologies can give you even more control over your child’s safety. From simple smartphone apps to cool techie gadgets, these innovative ways to up the ante on your baby-proofing game will make your house the safest on the block. Originally a smart thermostat, Nest now has a complete line of products that work together to give you an automated home. The Nest camera is sleek and easy to conceal on a bookshelf or cabinet in a child’s room. Check in on a nanny or caregiver — or just take a peek at that sweet pumpkin while they are napping — thanks to secure streaming on the Nest app. The Nest Protect smoke alarm, which lasts up to a decade and tests itself automatically, offers peace of mind by sending immediate alerts to your phone and telling you exactly what’s wrong. The Nest Protect also lights up as you walk underneath it, which means your child can avoid tripping hazards when they get up for a glass of water in the middle of the night. The SmartThings system sends you instant alerts if there is unexpected entry to your home, so you can feel safe if your child is home without you. With the SmartThings Arrival Sensor, you can receive alerts when your child arrives home — or leaves without your permission. The app also allows you to designate areas of your house as off-limits to your toddler or small child, and special sensors will send alerts to your smartphone if those limits have been breached. This can be a big bonus if you have a pool or a home with a large staircase, for instance. 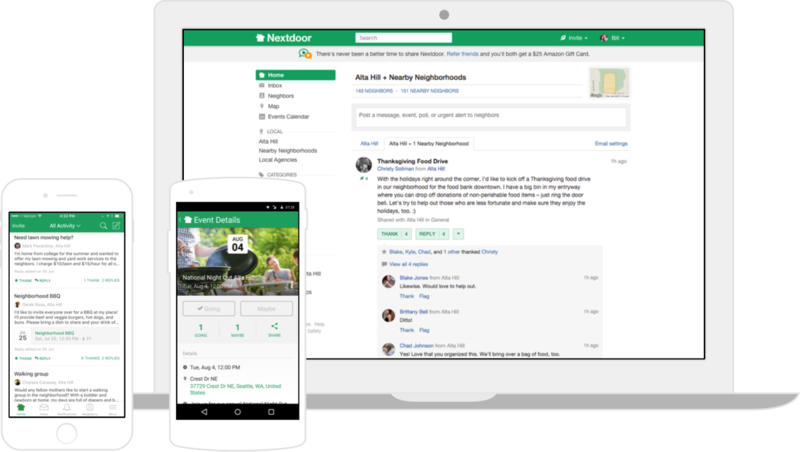 The Nextdoor app is designed to bring neighborhoods together to build stronger and safer communities. The free app allows you to enter your name and address, find your community, and begin providing and obtaining helpful information about your community. Use the app to find out whether there have been any recent break-ins in the area, who your neighbors recommend for babysitting duty, and where the best parks are for kids. Download the free app from the iTunes App Store or get it on Google Play. For those times when your child is ill and you can’t bear to wake them to take a temperature reading, the TempTraq will be your new favorite product. TempTraq is an adhesive thermometer applied to your child’s underarm that, once activated, will take digital temperature readings for 24 hours. You can check your child’s temp via an app on your smartphone and even send reports to your child’s doctor via the app. Apply these small stickers to your child’s clothing, shoes, or backpack and you’ll be able to track them with the connecting app. If they leave the safe zone you selected, you’ll be notified with an alert. You can also monitor their location with the app, to keep you comfortable about their safety at day cares or on play dates. Small children aren’t known for having the best sleep patterns. If you have one who wanders when everyone else is asleep, it can be dangerous. The Sleep Number bedding system has a special bed for children that is connected to an app that tracks sleep patterns and sends alerts to parents when children get out of bed at night. Pricing starts at $799.99 on www.SleepNumber.com. In the end, the very best thing any parent can do is trust their own instincts. These smart systems and gadgets enhance what you already know and do — and make it simpler for you to feel at ease about your child’s safety.